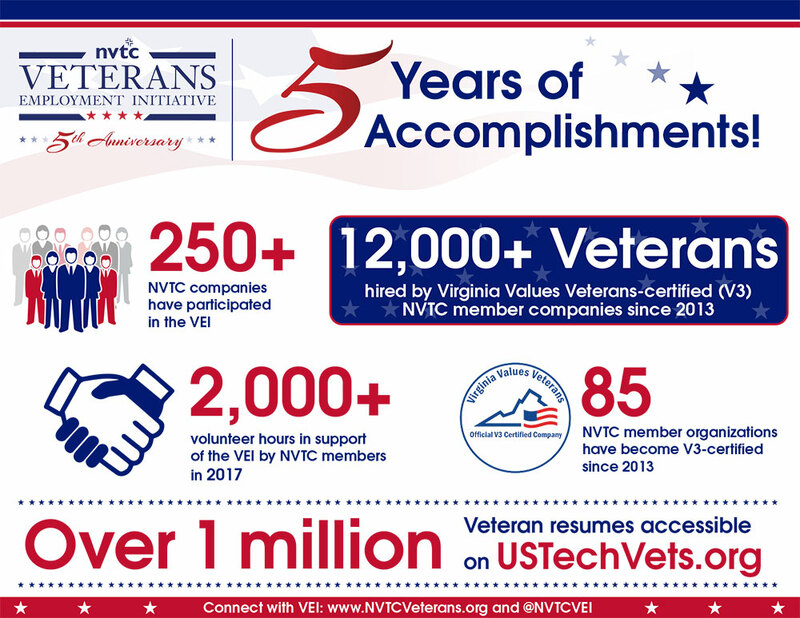 The NVTC Veterans Employment Initiative Turns 5! Launched in 2013, the NVTC Veterans Employment Initiative (VEI), supported by the NVTC Foundation, connects Veterans and military spouses to employment, internship, apprenticeship and educational opportunities and provides support to member companies in their efforts to recruit, hire, train and retain qualified Veteran and military spouse employees. The VEI is grateful to its committed VEI Task Force Members, engaged NVTC member companies and numerous partner organizations for their continued support of the program. Valuable opportunities for engagement in the VEI include free job postings and recruiting on USTechVets.org, regional hiring events, hosting Veteran student interns and training opportunities. Contact VEI Executive Director Steve Jordon to learn more. The NVTC Foundation relies on fundraisers, sponsorships and donations to support the VEI. Click here to support the VEI through the NVTC Foundation. Start accessing over 1 MILLION Veteran and military spouse resumes on USTechVets.org through free recruiter accounts. In addition, NVTC and CTA members get unlimited job postings. Join the over 650 recruiters already using U.S. Tech Vets! Start searching for candidates, posting positions and wrapping your company’s jobs on to U.S. Tech Vets today! The VEI has partnered with the Virginia Department of Veteran Services’ Virginia Values Veterans (V3) Program to provide Veterans workforce best practice education to corporate talent acquisition teams. Contact Northern Virginia Program Manager Rick Ferry to learn more about this free certification.